I am writing on behalf of Christian Education: Chesterfield Secretary Mavis Plumtree who is recovering from illness. Please remember her in your prayers. 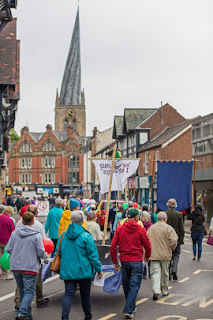 There will be a forum to discuss plans for the 2019 Procession of Witness (Whit Walks), on Monday February 11th at 7.30pm at Rose Hill URC. Members of all the churches in Chesterfield and district are welcome. Please come along and help us to shape this year’s celebration. Feel free to invite anyone that you think might be interested. The aim is to involve as many people as possible in the planning stages so as to make sure that we make an effective Act of Witness on the day. We hope that The Procession will once again be an effective celebration of God’s love and that it will benefit from large numbers walking , many decorated floats on lorries & trailers , some walking tableaux and indeed spectacle of any kind . The CE:C need your help tho give the occasion a vibrant feel that can convey, through the power of the Holy Spirit, a clear message to the people of our town and to visitors who turn out and watch. Best wishes and thank-you in advance for your help and support.